Last month when I was able to start knitting again I thought I would be able to jump right back into the saddle with no problems. I mean, I knew from the get-go that I would have to limit my knitting time quite substantially but I honestly didn't think I would also have to limit what I was able to work on. In all my years and with all my previous bouts of tendonitis I was able to ease back into knitting with nary a hiccup. But not this time. Nope. I discovered pretty quickly that my hands didn't like the idea of working with tiny yarn on tiny needles, but they were willing to knit with thicker yarns on anything bigger than a 3.25mm (US 3) needle. So I was able to (finally!) finish the knitting part on my PinkSand cardigan and then after realizing that I didn't have anything to work on that my hands could handle, I just had to cast on a few new projects. Yes, I HAD to. Heh...heh. 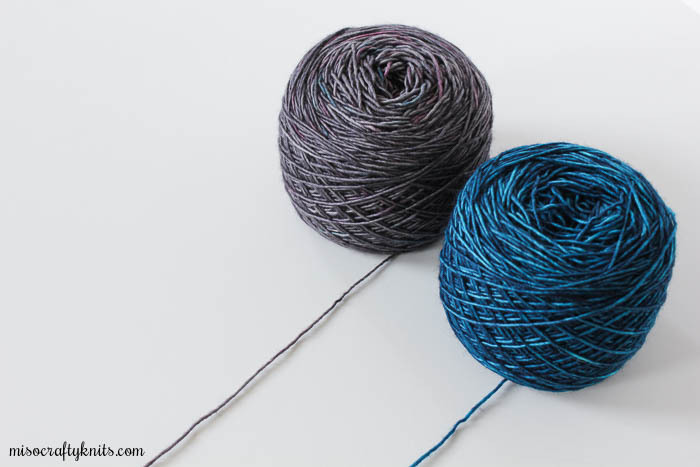 One of them involves worsted weight yarn on 5mm (US 8) needles and the other was an experiment as to whether or not if I would be able to deal with tiny yarn on big needles. I've had the Catkin shawl pattern in my queue for over four years and even had a bunch of yarns and colour combos picked out to go with it. But I just never had the guts to cast on. I gave it a lot of thought and came to the conclusion that I didn't want to cast on because I just had too many options available to me and felt nervous that I would pick the wrong colours and would not wear the shawl in the end. I forced myself to get over it and since I already knew what yarn I wanted to use (Madelinetosh Tosh Merino Light, as recommended in the pattern) all I had to do was pick out colours that would go well with the general colour palette of my wardrobe. Initially I had wanted to use neutral colours, like black and grey, but I didn't have either enough or the right shade of black yarn in my stash. I'm not really on a yarn diet per se, but I've made it a goal at the beginning of the year to make an honest and true effort to knit more from stash (and to not just say that I'm going to knit from stash, then proceed to barely glance at all my bins and then quickly run to my LYS to buy something that I probably already have). Since I seem to be in a grey phase, I picked out a grey and went on a search to find the right contrasting colour to pair it with. No, your eyes do not deceive you and no, this is not déjà vu. I really am knitting with Steam Age yet again. Steam Age is seriously one of my favourite MadTosh colourways. So much so that I think I had bought it in three different bases. I know, it's a total yarn piggy thing to do. 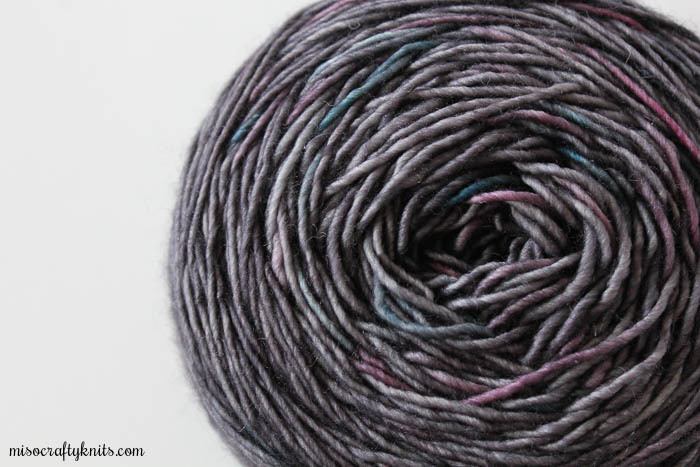 I bought this skein of TML with no actual project in mind for it, but completely aware of how my brain works, I bought it knowing that I would either use it solo or in a group to knit a shawl of some sort. And here we are. But I'll confess: I did make a trip to my LYS to see if they had any TML in a blue that matched the blue in my skein. Bad news: they didn't; good news: I didn't have to veer off my goal and decided to just use a skein of Baltic that, once again, I had bought with no project in mind for. At first I hemmed and hawed over whether or not if Baltic was the right choice. I thought maybe it wasn't light enough and was too similar in saturation with the grey in Steam Age. There was only one way to find out - swatch. 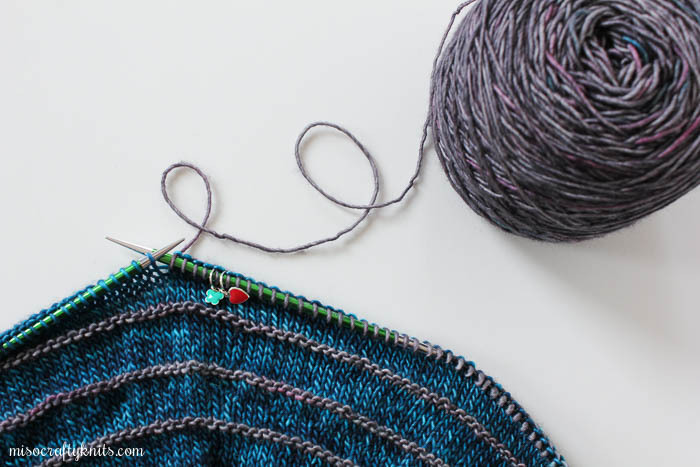 Normally I don't swatch for shawls (I know, I know...) but this time, aside from wanting to see how the colours looked knitted up together, there was something nudging at my gut and was demanding that I do a proper gauge swatch. I may not always trust my gut instincts when it comes to life matters, but when knitting is involved, I've learned that my gut has always been right. Whether I choose to listen to my instincts though, is a whole other story. This time, the voice in my head was really strong and loud, and experience has told me that when it's like this I should definitely listen. And boy, am I ever glad I did! Typically I'll knit a shawl in the recommended needle size and then hope for the best that a good, agressive blocking will sort out the rest. If I had done all that with this Catkin pattern I think I would have produced a very small, and probably un-wearable, shawl. 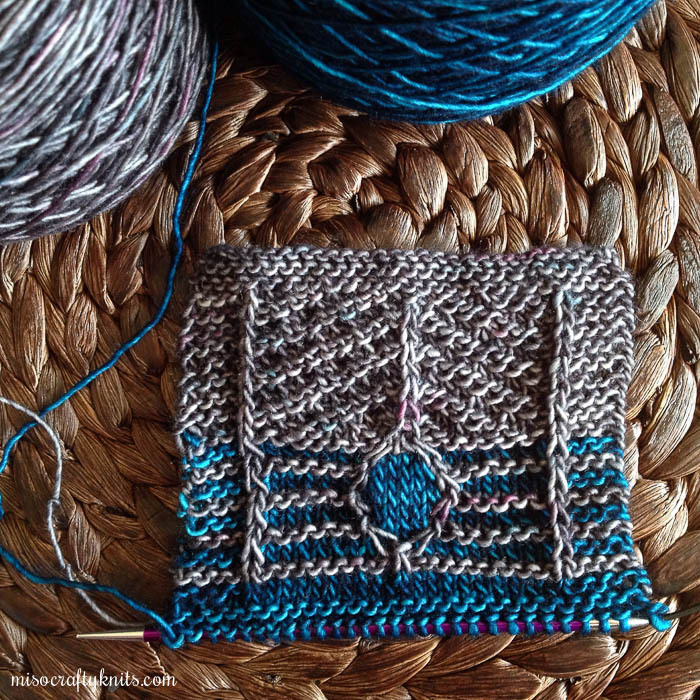 My first gauge swatch was a little over half an inch too small in all directions! Yikes! BUT, I got to see that the colours really did look fantastic together! Would you believe that this is probably the first time in which I actually enjoyed knitting a swatch?!? And that I honestly didn't mind having to knit another?? It's crazy, I know! But how could I not enjoy it, just look at the swatch, it's so pretty! I whipped up another swatch and ended up having to go up two needle sizes. I'll say it again, I'm SO glad that I did a gauge swatch! I wish I could say that since knitting the swatch that the actual knitting on the shawl has been smooth sailing, but it hasn't. I keep making simple mistakes, like not twisting my yarns at the beginning of each right side row (and then having to tink back two rows because I can't stand the long float along the edge). At one point I thought I had lost my knitting mojo because I had discovered an odd looking stitch amongst a row of garter. Something about it really bugged me and it took every fibre of my being to not drop down and try to fix it. Upon closer examination I noticed that the garter stripe that the stitch was a part of was wonky looking in general. To me it stood out from the other stripes and I thought that I had done something seriously wrong. Double checking the pattern instructions and then looking at other Catkin shawls on Ravelry, I saw that the garter stripe was suppose to look like that due to an increase row that happens right after. Now, if I was smart and had read the entire pattern thoroughly before I started knitting and not just give it a quick scan to get the gist of it, I would've caught this oversight and made note to do the increase row a few rows after the garter stripe then I would have been able to avoid the wonky stripe action before it even had a chance to be knitted up. But who does that? Who reads over a pattern that meticulously before they start knitting?? What knitter makes their life that easy? I was too far ahead at this point to even think about ripping back to fix this issue, so I've left it. Shocking, yes. But I've also made it a goal this year to not be such a nit picky perfectionist. Especially when it involves knitting. Making and creating should be fun and stress-reducing, not the opposite! Surprisingly (after a few days) I've able to let this wonky stripe business slide and I've kept on knitting. A situation like this is when I really hope a good, aggressive block will do the trick in making things look good. So far this pattern has been a nice knit. Last weekend I managed to finish the first section, which was easy and didn't involve too much attention (aside from remembering to twist those darn yarns if I don't want to weave in a thousand ends later) and now I'm onto the first chart. Judging from the swatch, I'm going to say from here on in this project will not be taken out of the house or worked on in a social setting. The charts aren't exactly difficult or overly finicky and there's no yarn overs to worry about (I always manage to miss yarn overs which completely messes me up), but the stitch pattern doesn't have a "resting row" and so each row has something different going on. Not familiar with the term "resting row"? It's a row in a pattern in which you straight up knit or purl. It's usually on the wrong side following a "pattern row", since the right side is generally where the design is worked on. Ooohhh...Martina Behm has a new pattern out! Oops! See? Mind of a magpie. That's me. Now where was I? Oh yes, Catkin. It's not leaving the house. But that's ok. My hands and wrists have been acting up this week and so I'm needing to take a little break from knitting anyways. It has been confirmed a few days ago that I do indeed have carpal tunnel syndrome in both of my hands. Luckily it's not severe and I don't need surgery. But to complicate matters more I'm also dealing with a super mild case of de Quervain's in both wrists AND metacarpal issues in my left thumb. Grrrr... I'm just glad that my doctors don't view my knitting as a cause of all this and have stated that I can continue to knit, albeit a teeny tiny bit at a time when my hands will allow it. They know and understand that knitting is my livelihood and what keeps me sane, and telling me to stop completely will mean nothing but mental anguish and sheer frustration. I just have to remind myself often to take more breaks. What a lovely colour combination! This shawl is going to be gorgeous. Glad your knitting again. that colour combo is out of this world awesome, and the yarn looks sooo soft, I hope it's nice and gentle on your wrists.